In a scant ten year period, the amount of people that are unaffiliated with any religion has nearly tripled, and now represents something in the high teens of our population. 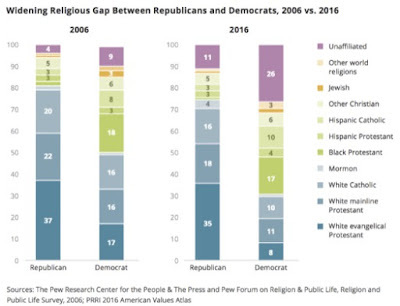 Every other religion has shrunk markedly, with the exception of Mormon and "Other" which is likely Islam. Europe has moved a much quicker trajectory, and we appear to be following in their footsteps. Where will we be in another ten years, and what will the ramifications of that look like on our society?